Meall nan Ceapraichean and Eididh nan Clach Geala are sister peaks flanking a high corrie containing a small loch, Lochan a' Chnapaich. The steep and craggy W slopes of Meall nan Ceapraichean overlook Gleann na Squaib and together with the crags of Beinn Dearg produce a narrow crag lined pass. The main summit ridge runs E 2.5km to a minor top, Cnap Coire Loch Tuath then turns ENE towards Gleann Beag. This ridge has very steep and craggy S slopes but they are easy to moderate. 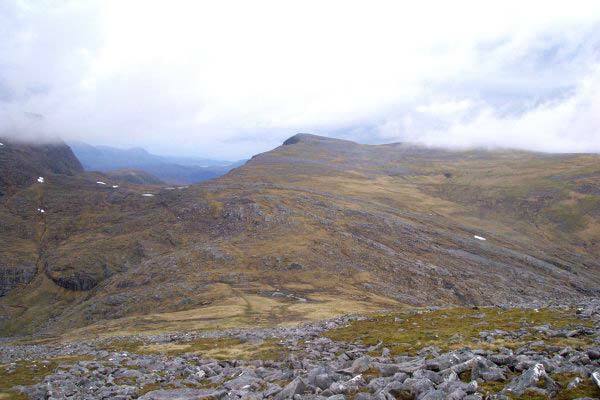 There is also a short SE ridge with easy slopes leading to the bealach at the head of Gleann na Squaib where the path from Inverlael terminates. 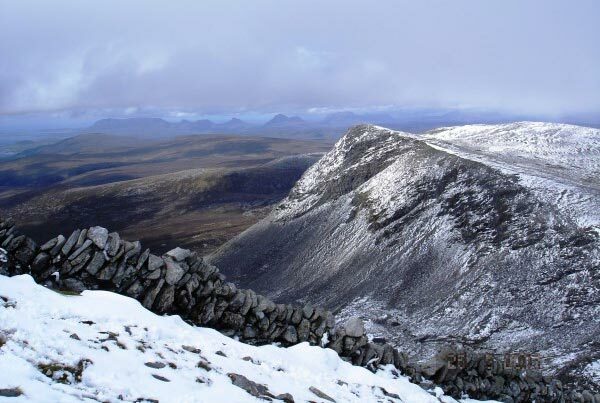 This bealach also provides access to Cona' Meall and Beinn Dearg. 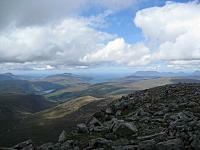 Meall nan Ceapraichean from the descent of Cona Mheall. 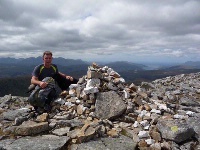 Meall nan Ceapraichean from Destitution Wall on Beinn Dearg with the Assynt hills beyond - May 2007. 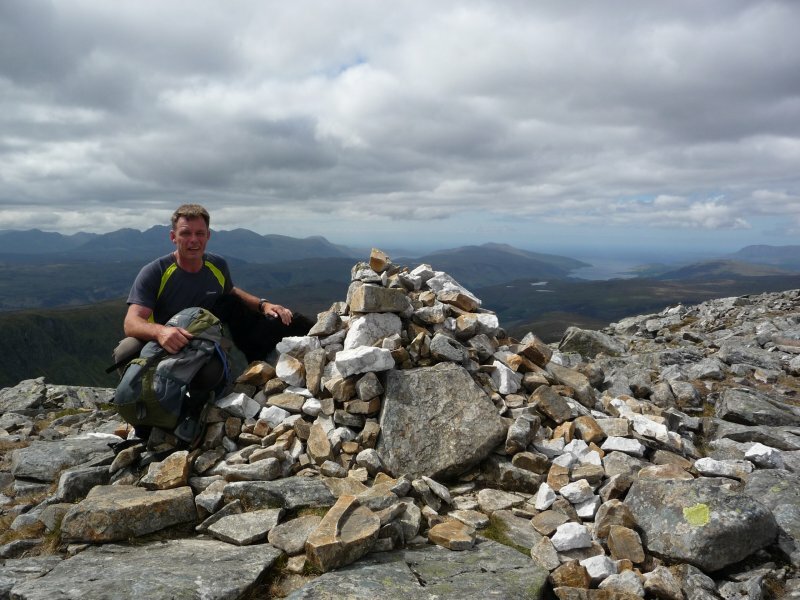 The summary information of one or more ascent routes that include Meall nan Ceapraichean. 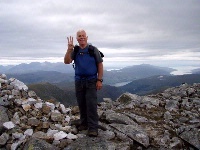 Post a few words about Meall nan Ceapraichean or read what others have had to say. Taking the track from Inverlael up to point 886m on the OS map allows you to climb this hill via its south east ridge which is a very gradual ascent. The path clings to its precipitous western side which in the ultra windy conditions we had proved quite dangerous. However it is a fine hill that could easily be added with the surrounding hills depending on your personal preference. A long day even in summer but its worth the effort. 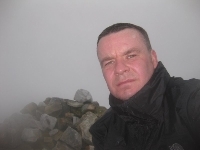 I walked over to Glenbeg and stayed in one of the 2 bothies there. Then on to do Seana Bhraigh. This is marvelous remote mountain country. All 5 hills in this group can be achieved in an overnight bivvy by this route. No one should underestimate the remoteness of these hills or their size. This is a serious expidition in any circumstances.